You know how it goes when you want something...you just have to have it. Well, I was wanting something sweet after dinner one night and an Almond Joy sounded really good. My son got a couple when he was trick-or-treating, but well, those are long gone. Him and my husband both hate coconut so they were all mine. He, he. The coconut craving stuck around for awhile so I had the sudden inspiration to create something with chocolate and coconut. I had a bag of coconut and a bag of chocolate chips in the fridge so I grabbed them both and brainstormed. I didn't have anything to make an Almond Joy type candy (which I totally did last year and just realized that I never blogged it!) so I had to come up with something else. Melted chocolate and coconut are perfect together so I did that but stepped it up a little with some almond extract. Hey, I needed to put almond in there somewhere, right? 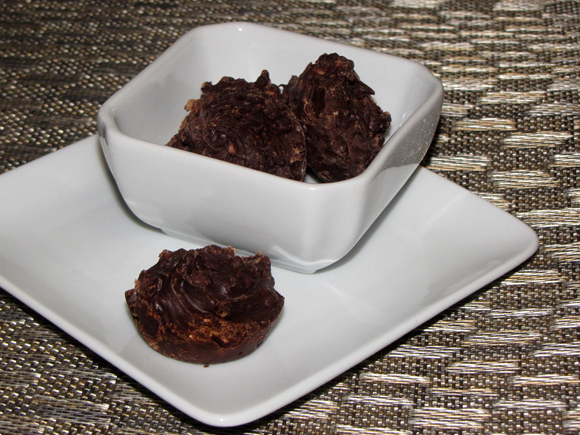 They're perfectly sweet, perfectly tasty chunks of coconut-infused chocolate. These are a hard chocolate version so I might change it up at some point and whip up a coconut chocolate truffle. Yum. Think I'll put that on my to do list right now! 2. Stir the chocolate until all is melted then mix in the coconut and extract. 3. Place about 2 teaspoon-fulls (or your preferred size) onto wax/parchment paper for each candy*. Allow them to sit and firm up for a few hours or stick them in the fridge for a faster set. Store in the refrigerator in an air-tight container. * I pressed the teaspoon-fulls into mini-muffin tin cups for the shape.